El Greco is one of a few restaurants in Seattle that has Sweet Potato Fries on their menu. If you haven't tried them yet what are you waiting for?! GO TRY THEM!! They are delicious! You won't go back to regular fries ever again. They even offer them as an appetizer, so you can try them out without having to order an entree. Trust me, you'll love 'em! I highly recommend the Moroccan Marinated Chicken. I've had this several times and it's always spot on. If you're not a fan of cous cous you can substitute the sweet potato fries with that dish. Now that's heaven! 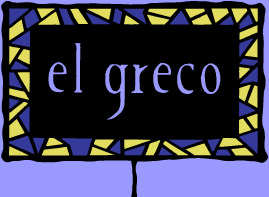 I enjoy going to El Greco because the staff is always so friendly and very knowledgeable about their food. So the next time you're looking for some good food, go to El Greco and order the sweet potato fries. I give El Greco 4 out of 5 stars.